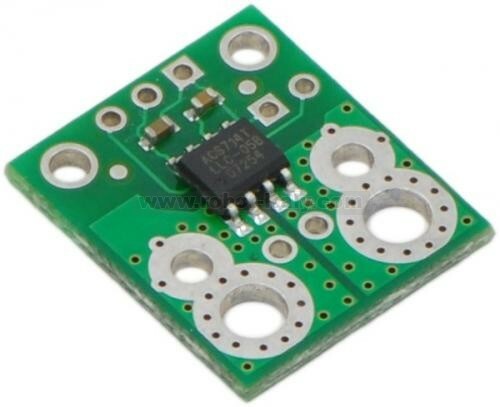 This board is a simple carrier of Allegro’s ±5A ACS714 Hall effect-based linear current sensor, which offers a low-resistance (~1.2 m&#937;) current path and electrical isolation up to 2.1 kV RMS. This version accepts a bidirectional current input with a magnitude up to 5 A and outputs a proportional analog voltage (185 mV/A) centered at 2.5 V with a typical error of ±1.5%. It operates from 4.5 to 5.5 V and is intended for use in 5 V systems. This board is a simple carrier of Allegro’s ±5A ACS714 Hall effect-based linear current sensor, which offers a low-resistance (~1.2 mΩ) current path and electrical isolation up to 2.1 kV RMS. This version accepts a bidirectional current input with a magnitude up to 5 A and outputs a proportional analog voltage (185 mV/A) centered at 2.5 V with a typical error of ±1.5%. 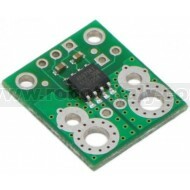 It operates from 4.5 to 5.5 V and is intended for use in 5 V systems. Designed for bidirectional input current from -5 to 5 A (though the robust sensor IC can survive up to five times the overcurrent condition). Conductive path internal resistance is typically 1.2 mΩ, and the PCB is made with 2-oz copper, so very little power is lost in the board. Use of a Hall effect sensor means the IC is able to electrically isolate the current path from the sensor’s electronics (up to 2.1 kV RMS), which allows the sensor to be inserted anywhere along the current path and to be used in applications that require electrical isolation. 80 kHz bandwith that can optionally be decreased by adding a capacitor across the board pins marked “filter”. High accuracy and reliability: typical total output error of ±1.5% at room temperature with factory calibration, an extremely stable output offset voltage, and almost zero magnetic hysteresis. Automotive-grade operating temperature range of -40°C to 150°C. The pads are labeled on the bottom silkscreen, as shown in the picture below. The silkscreen also shows the direction that is interpreted as positive current flow via the +i arrow. 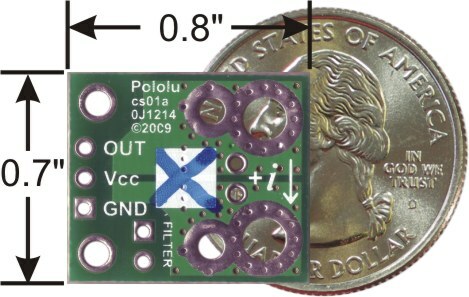 This sensor ships assembled with all of its required surface mount components, as shown in the main product picture. We sell a 30A unidirectional version and ±30A bidirectional version version of this board; you can distinguish these versions by reading the text on the IC or by looking at the color of the X on the bottom silkscreen. This version is marked with a blue X. The sensor requires a supply voltage of 4.5 – 5.5 V to be connected across the Vcc and GND pads, which are labeled on the bottom silkscreen. 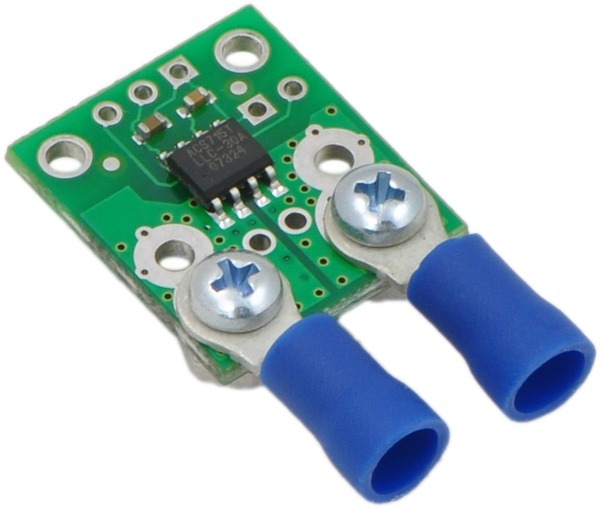 The sensor outputs an analog voltage that is linearly proportional to the input current. When Vcc is 5 V, this output voltage is centered at 2.5 V and changes by 185 mV per amp of input current, with positive current increasing the output voltage and negative current decreasing the output voltage. The board has two mounting holes on the logic side of the board. These mounting holes are 0.5" apart and are designed for #2 screws. where Cf is the value of the capacitor added to the filter pads.